thanks much for this Shady!!!! Last edited by unclecid : 09-16-2010 at 08:55 AM. 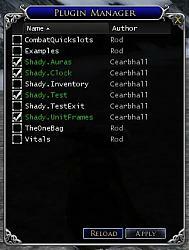 Maybe this should be uploaded to LotRO Stand-Alone Plugins\Other as well. I didn't even know that this category existed. And I agree - this would probably be better under "other"
Last edited by MrJackdaw : 09-16-2010 at 02:31 PM. This is an absolute must for plugins. I love having to just click one shortcut for manager and having all my individual plugins load automatically. Now, how do you load it on start up? Is there an INI file that we can add start up commands that happen every time we start the game? All we need is a '/plugins load manager' and we're good to go, right? I would love to see an option for us to be able to add the / option commands for each plug-in on this manager. I use several different plug-ins across all my characters and it's really hard to keep track of them all. Maybe right-click on a plug-in within the manager and it opens a window with slots to add / commands in for them. There are some that only use one, but there are some that have several. I don't know if this is possible, but would like to see it if possible. Thanks for your time with this plug-in. This is in a shady category. I can't find it back in the menu. I have downloaded it, I know where to find it, but have no idea how to activate or use it.... Help! Not unless Codemasters has released the F2P version of LoTRO. 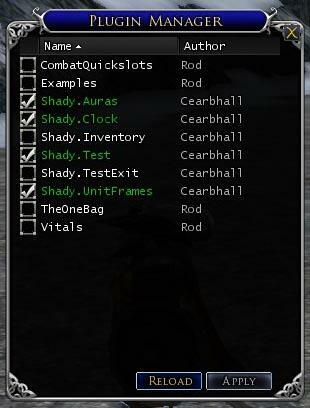 The plugin manager doesn't work completly with the changes upcoming with the November Update. I am getting errors when trying it out on Bullroarer, and I have to load it twice for it to work and have to hit the reload button each time for it to show the plugins that I was using before. Hated having to to type the command to launch my plugins every time I logged in, I asked and askd, but no one could tell me how to make a macro button to do it. So here it is, hope it makes you game play more enjoyable. Good Luck and Good Hunting to you!